The book is part of the renewed debate on equality. In the wake of a leftist libertarian approach, equal freedom is in my opinion the fundamental characteristic of a “good place” to live is equal freedom. However, if someone is subordinate to the power of others, he is not free; and if someone leads others, exercising his power, he cannot enjoy the interaction with free people. Therefore, an effective equal freedom requires equality of power. Isocracy is a society where nobody commands or obeys; a place where there is order without power, where cooperation is non-hierarchical. More precisely, in order to prevent someone from prevailing over others, his power must be neutralised by another power. 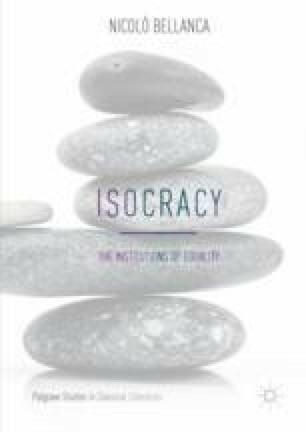 Isocracy is a society in which institutions try to facilitate the mutual balancing of the various forms of power. Even without reaching the perfect and definitive levelling of powers, those who come to lead within a certain sphere cannot prevail also in other spheres, without bearing costs, ultimately dominating overall. Schlosser, Markus. 2015. Agency. The Stanford Encyclopaedia of Philosophy, ed. Edward N. Zalta. http://plato.stanford.edu/archives/fall2015/entries/agency/. Accessed September 15, 2017. Wilde, Oscar. 1891. The Soul of Man Under Socialism. http://libcom.org/library/soul-of-man-under-socialism-oscar-wilde. Accessed September 15, 2017.